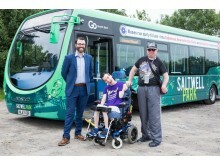 Chase Park Festival at Saltwell Park has forged an alliance with the largest bus operator in the North East to ensure that disabled music lovers can get to the site safely to this year's grand event and enjoy its strongest line-up of live entertainment to date. Taking place at the new location of Saltwell Park on Saturday 26 August, the festival, known for its gold level of access for disabled guests and performers, has partnered with Go North East as a result of its dedication to providing regular accessible buses for people with a disability in Tyne and Wear. Paving the way for yet another memorable instalment of first-class music at the region's true “Festival For Everyone,” which will this year feature the likes of The Coral, Little Comets plus Cattle and Cane, Chase Park's Festival organiser, Alistair McDonald explains: “We have been looking for a transport partner for a number of years and we're delighted to have found one in Go North East. “With the move to the new site, I think we are much more central and easy to get to from other parts of Gateshead, Newcastle and further afield, however, we really needed someone who could ensure our disabled music fans could get along. The accessible buses that have stops in close proximity to the park are fantastic and will make a massive difference. “As the festival grows each year it is very important to have partners who can assist us with things such as accessible transport. Go North East's Saltwell Park service (numbers 54 and 53) runs every 10 minutes to the park directly from Newcastle and Gateshead, including on the day of the event. Its popular Angel service (number 21), also passes the park, with stops in Low Fell, running up to every seven minutes at peak times from Newcastle to Chester-le-Street. 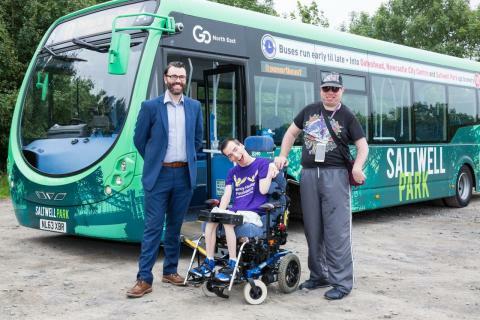 Stephen King, head of commercial and retail at Go North East, adds: ““We work tirelessly to make sure all our passengers feel, comfortable, safe and respected on our buses, which is why we are so committed to accessibility for all. We’ve made essential introductions as a result, including audio-visual next stop announcements on our buses, ongoing driver training in the areas of physical disabilities, dementia and sight problems and by having an unwavering position on easy access. All buses are 100% accessible and boast contactless payments, making for hassle-free travel. Go North East's commitment to providing exemplary transport services to the region’s visitors and those with disabilities and special access needs recently earned the operator a top honour in the Inclusive Tourism category, at the North East Tourism Awards. Tickets for this year's Chase Park Festival at Saltwell Park are on sale now. For more information about the line-up and to buy tickets visit www.chaseparkfestival.co.uk.